JCW Acoustic Flooring was formed as a division of JCW Floor Screeding in 2004 to cope with the increasing demand for an acoustic flooring specialist now with over 15 years specialist experience and installing over 100,000m2 of acoustic floors per year JCW Acoustic Flooring are the company you can rely on! Flexible service – With up to 10 teams of installers we ensure your deadlines are met. Professional work – Full site survey carried out on each job by our surveyor. Acoustic Flooring is a flooring system designed to reduce the transmission of sound through a separating floor. It is usually specified within apartments and hotels but can also be utilised with houses. It can be a timber flooring solution like an acoustic deck comprising chipboard and foam or an acoustic batten system like the JCW 80T. It can also be a screeded solution made up of a sand cement screed and a resilient layer. How to reduce noise through floors? There are a number of factors that need to be considered when trying to reduce noise through floors. The system proposed will depend on; the use of the building, the construction of the subfloor, the ceiling treatment below, and the type of noise that you are trying to reduce. 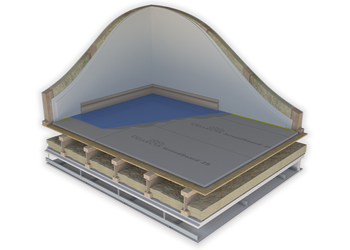 Acoustic floors are primarily used to reduce impact sound but can also be used to reduce airborne sounds. How to test floors for sound transmission? Insulation between floors building regulations? 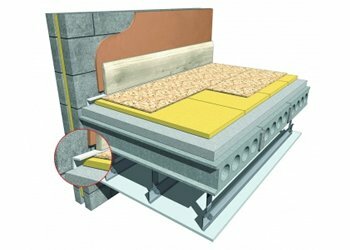 Mineral wool is often used as insulation between separating floors, it can be used between joists, or within a floating floor or ceiling void. Part E of the Building Regulations should be referred to for performance requirements as this covers the passage of sound between walls and floors. How to install acoustic flooring in commercial buildings? There are a number of systems that can be considered when installing an acoustic floor within a commercial building. Each one is dependent on the building and its use as well as other specific factors like the subfloor construction and ceiling detail. An acoustic consultant should be contacted to ensure that the correct system is used. With over 15 years of experience, JCW Acoustic Flooring have the knowledge required to ensure that all projects are carried out to the highest standard. To make an enquiry, simply complete the form below. We will be delighted to hear from you.